A home-made (home-maid?) platform game in Castlevania-style, featuring a maid. The player must avoid and kill enemies, pick up keys and open doors,all the while reaching the exit before the time runs out. 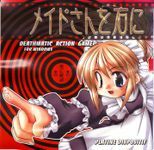 The voice effects, especially the one when the maid is killed, quickly became a semi-cult in the Japanese fandom world for indie games. The game itself, is like most Platine games, disturbingly hard.